I thought I would offer something fun during this Bloggiesta weekend and for Weekend Cooking! I know you must be like me: having tons of cookbooks laying around but you barely used most of them. Well I thought it would be nice to change that! So I am hosting this challenge to we get our butts in gear and use those cookbooks! We will be doing this during the months October and November. This will give everyone plenty of time to sort out which cookbooks you want to start cooking from and actually do it! Also with the holidays approaching, it could be a nice chance to try things out. - Sign ups stay open during the whole of October and November so jump in any time you want. Edit: To link up progress and wrap up posts, please go here. Ooooh funnnn!!!!! I have one or two cookbooks sitting around that I've never cooked from. This sounds like fun. I have tons to choose from, looking forward to the challenge! The infrequently used ones tend to contain complicated, time-consuming recipes, so this would be a big commitment. I am going to look at these books, though, and see what looks possible. Nice idea. Interesting challenge - I am planning a special book event in November where everyone links in their very most favourite cookbooks. So many cookbooks are pretty rather than useful. Have a good week. I'm in!!! I've actually been thinking about doing something like this too since my Operation Kitchen stuff is wrapping up in the next few months. We have until the end of November? This is a great idea. I am embarrassed to admit the number of cookbooks I own -Some that I have never made anything from. My 16 year old and I often cook toghether so we will do this together. This does sound like fun. I'm trying to be careful about overscheduling myself with blog stuff, but I will definitely be considering joining in on this! Wondering, could I get my husband to do this? Great idea! I've two cookbooks on Japanese cooking I want to review, so I might join this. Picked books for this coming weekend for the challenge - Williams Sonoma Cooking for Friends by Allison Attenborough & Jamie Kimm. Think that we're making short rib shepherd's pie. i also think we'll use The Barefoot Countessa's How Easy is That? to make the Roasted Salmon with green herbs. I'll let you know how it goes. I'm in! 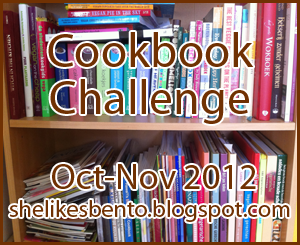 I just wrote up my cookbook challenge post on my blog and even pulled four cookbooks off my shelf from which to cook! I'm excited to finally try some new recipes after having these cookbooks for YEARS! I linked to my blog instead of the amission post... Could you edit the link? It should be: http://gnoegnoe.wordpress.com/2012/10/07/veganmofo-day-7-a-sunday-salon-about-cookbooks-and-challenges/. I like to make bento's because they make people feel special! I also think it beats the same boring sandwich every day. All though I don't make the cutest bento's around, I am blogging my efforts to show that anyone can do this! So join in the fun, and let me know where I can find you! Copyright © Cynni Alders 2013 All Rights Reserved. No part of this blog may be reproduced. Watermark theme. Theme images by merrymoonmary. Powered by Blogger.